How many times have you heard the word “no”? Even worse, how many times have you told yourself “no”? How many times have you felt that you just weren’t good enough!!! YIKES!!! It is that exact thought that haunted me yesterday. As you may already know, I am preparing for the Toastmaster’s International Speech Contest held in Washington DC this August. The way it works is that I will compete against 96 people in the semi-finals. They then narrow it down to 10 competitors who advance to the finals, and you compete again two days later with a new speech. I don’t have to tell you that the tension is high. Not only do I have to create two winning speeches, I have to find the perfect look because I will be standing in front of 2,000 plus people. More importantly, I need to portray the right image. In other words, I must find a way to stand out from my competition – both in the way I look and in the speech I deliver. So yesterday, I went shopping for the perfect outfit. As I struggled to find the “winning” look, a thought occurred to me: Maybe I should leave the price tag on the dress just in case I don’t advance to the finals. If I don’t wear it, I can return it. WHAT! Was I actually telling myself that I may not be good enough to win? It’s then that I realized I was telling myself “no”. I searched desperately for that mental delete button so I could get that thought out of my head as soon as possible. I REFUSE to tell myself “no”. Immediately, I started to replace that thought with images of me standing on stage holding that first place trophy. Immediately, I gave myself permission to earn the title of International Speech Champion. So once again I ask you: How many times have you told yourself “no”. 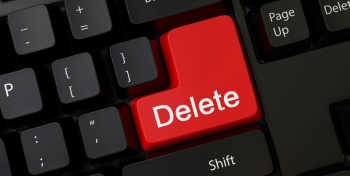 Search for your own internal delete button and press it as fast as you can. Replace it with a visual of what your end goal will look like. Hear, smell, feel, see and taste your success. It will elevate you to a place that words can’t describe. Thank you for sharing how you go through that mental process: delete and replace, then make it real by imagining your success in all it’s sensory detail. It really is a process and I have to practice it every day. The rewards are well worth it, though.